As a chef, a restaurateur, an advocate for social justice, and a philanthropist, you have fed people all over the globe in times of great need—and brought delight to diners at your thirty restaurants. Your nonprofit World Central Kitchen and #ChefsForPuertoRico network have provided meals after disasters such as Hurricane Harvey in Texas, the wildfires in Southern California, and Hurricane Maria in Puerto Rico. Your ThinkFoodGroup includes some of the most celebrated restaurants in the United States and beyond, winning you Michelin stars and the respect of your peers. You have earned the Outstanding Chef Award from the James Beard Foundation, and a Lifetime Achievement Award from the International Association of Culinary Professionals. You emigrated from Spain to the United States, and the needs and concerns of immigrants and refugees are close to your heart. In 2014, you were named an Outstanding American Citizen by Choice by U.S. Citizenship & Immigration Services, and this year you received the Humanitarian of the Year Award from the James Beard Foundation. 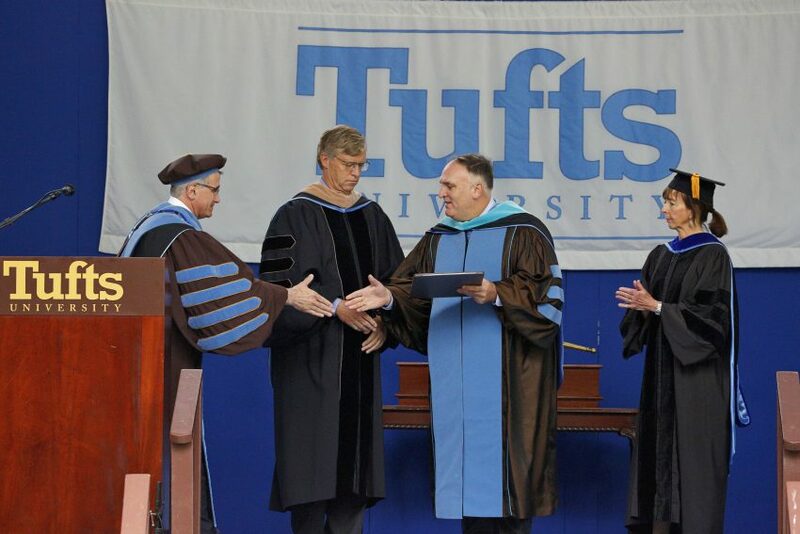 For your commitment to fighting hunger and poverty, and to helping communities empower themselves, Tufts University is pleased to award you the degree of Doctor of Public Service honoris causa. With his World Central Kitchen nonprofit organization and #ChefsForPuertoRico network of chefs and volunteers, Andrés has been providing training and meals for those in need, most notably after disasters such as Hurricane Harvey in Texas, the wildfires in Southern California, and Hurricane Maria in Puerto Rico. He arrived in Puerto Rico just days after the September 20, 2017, hurricane, and World Central Kitchen remained for months, dishing out millions of meals in both urban and rural areas across an island left largely without power. With his commitment to quick emergency response, a global network of volunteer chefs, and adept use of social media, Andrés and World Central Kitchen have been able to fill the need, and empty bellies, in some of the most difficult circumstances. But diners do not have to be in desperate straits to eat Andrés’s food—to the contrary, his ThinkFoodGroup includes some of the most celebrated restaurants in the United States and beyond. He is an internationally acclaimed culinary innovator who trained in his native Spain with the renowned chef Ferran Adrià and who was instrumental in introducing tapas and the concept of small plates to American tables. He has a two-star Michelin restaurant (Washington, DC’s minibar by José Andrés) and four Bib Gourmands—Michelin’s designation for restaurants that offer exceptional food at moderate prices. Andrés has earned the Outstanding Chef Award from the James Beard Foundation and been named one of 100 Most Influential People by Time magazine. In 2017, he received a Lifetime Achievement Award from the International Association of Culinary Professionals and recently received the 2018 Humanitarian of the Year Award from the James Beard Foundation. He is an author and teacher and was host of Spain’s highest-rated television cooking series. In 2016, Andrés joined President Barack Obama’s delegation to Cuba, where he participated in panels on entrepreneurship—“I am here as a small businessman, as a youngster who came to America and who slowly built up his own small company,” he told the Spanish-language newspaper El País. Andrés will receive an honorary Doctor of Public Service degree.